Epic's ever-changing monster rolls out updates like no other game. 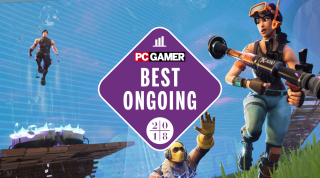 Fortnite gets our award for Best Ongoing Game 2018. Check out the rest of our awards and personal picks in our GOTY hub. James: I have played more Fortnite than any other game this year, more than any other multiplayer game in my life, and I’ve yet to win more than three solo games. That’s an endorsement, not a cry for help. While the building system is difficult to learn (so was WASD, once), stumbling into basic competence is made palatable by a playful mixture of weapons, tools, and vehicles. I regularly see duos propel themselves hundreds of feet into the sky on the back of an ATV, sniping players in an accidental homage to the best bits of Halo and Tribes. I nabbed a second place spot by consuming stones that turned me invisible, stalking players in their hidey-holes before surprising them with a shotgun hello. And yeah, I’ve won a few infamous build battles. They may look inscrutable, but I’ve had MOBAs explained to me dozens of times. And besides, winning is rarely the reward. So long as I improve my building or pull off a wacky play with the grappling hook, deployable transdimensional rifts, portable fortresses, balloons, jetpacks, shockwave grenades, or whatever volatile gadget Epic introduced that week, I’m probably having a good time. And yet, so much of discussion around Fortnite orbits its face. Strip away the meme dances, the $20 skins, the celebrity streamers, the brash teens. What’s left is just a creative, surprising, hilarious, and totally unique shooter. It is a near perfect PC game. And it’s free. Wes: I'm terrible at Fortnite, but that hasn't stopped me from having fun with it. The building system and bright, cartoony world bring me back to playing with toys as a kid—it's the rare multiplayer game where the more imaginative and creative you are, the better. Mostly, though, I've enjoyed watching Fortnite evolve week-by-week, keeping its millions of players on their toes by constantly upending the meta. So far, at least, Epic has barely cared about catering to the competitive scene, while the rest of the world is desperate to launch the next big esport. Think about how amazing that is: the biggest game in the world is being designed with a cavalier spaghetti-on-the-wall mentality. Jarred: I rarely make it into the final 10 when I play, but the regular limited time modes are a great diversion. They're chaotic and sometimes don't work, but the 50v50 fort battles were amazing. I probably caused more harm than good, but my team won about half the time. Law of averages is on my side in that sort of competition. Samuel: As someone who's written up what feels like one million patch notes for Fortnite, the breakneck pace at which updates roll out for the game is incredible—adding new modes, tools, revisions to the map, and changing the way people play overnight. The Infinity Blade was in the game and gone before I even had a moment to boot it up. That's why I think it deserves this award more than anything else this year. It has changed expectations of what a continuing, live game means, and I can't see any way other developers will be able to keep up. It's such a generous experience for a free game—and I say that as one of those deeply old men who doesn't give a damn about emotes, skins, or things that children like. Check out James's review of the game from earlier this year.